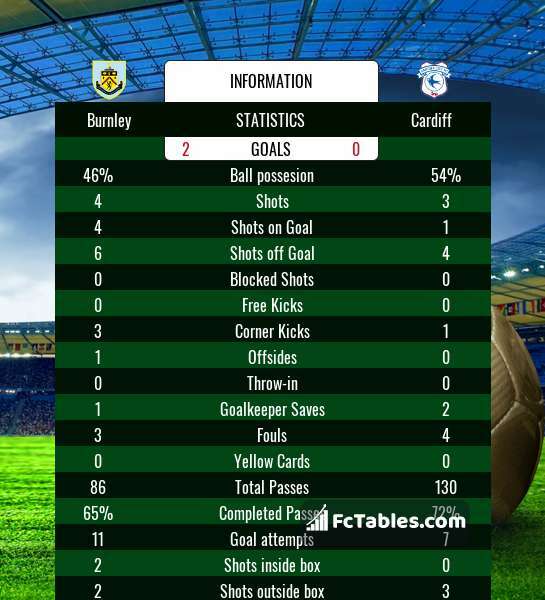 The match Burnley-Cardiff Premier League will start today 14:00. Referee in the match will be Mike Dean. Team Burnley is located in the middle of the table. (15 place). Burnley in 5 last matches (league + cup) have collected6 points. from 2 matches team have not been defeated. The best players Burnley in Premier League, who scored the most goals for the club: Ashley Barnes 10 goals, Chris Wood 8 goals, Johann Berg Gudmundsson 3 goals. Players with the most assists: Ashley Barnes 2 assists, Chris Wood 1 assists, Johann Berg Gudmundsson 5 assists. Injured players Burnley: Peter Crouch, Steven Defour, Aaron Lennon. Team Cardiff is in the releagtion zone of the table. 18 position. In 5 last matches (league + cup) team gain 3 points. Cardiff did not win the match from 2 games. Leading players Cardiff in Premier League is: Victor Camarasa 5 goals, Bobby Reid 4 goals, Callum Paterson 4 goals. Most assists in the club have: Victor Camarasa 3 assists, Bobby Reid 2 assists, Callum Paterson 1 assists. In Cardiff not occur in the match due to injury: Callum Paterson, Souleymane Bamba. Direct matches: usually ended with winning of Cardiff. Balace of both teams games are: 4 won Burnley, 8 wins Cardiff, 11 draws. In 10 matches the sum of the goals both teams was greater than 2.5 (Over 2.5). On the other hand, 18 matches teams scored more than 1.5 goals (Over 1.5). In 13 matches the both teams have shot at least one goal.